We don’t claim to be experts on how to cure a hangover, but we’ve had many (too many?) over the years and we’ve found a few tried and tested remedies that seem to help us. Of course, the best way to avoid a hangover is to drink in moderation, but we all know that’s easier said than done. Drinking water throughout the evening is the best and surest way to avoid over consumption and the dehydration that comes with it. Stay hydrated and slow the pace of your drinking by alternating between a glass of water and the next cocktail, especially if you’re drinking something as easy to down as a Veuve and Bourb! Don’t drink on an empty stomach. Eat some starchy, low fat food that will help absorb the alcohol in your stomach and slow alcohol absorption. Drinking on an empty stomach is the surest way to early drunkenness and a night on the bathroom floor. Adding a little lean protein to your pre-drinking meal will slow digestion of the alcohol and will keep it from spiking all at once. Before popping those corks or shaking those martinis, eat a banana or drink some coconut water. 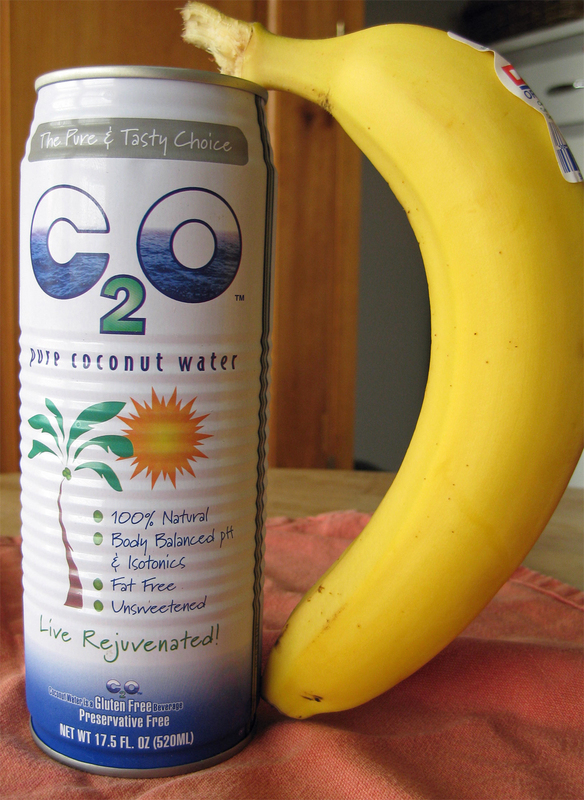 These two items are high in potassium and other electrolytes, things we eliminate through increased urination and the consequent dehydration. Revisit potassium again at the end of the night to ensure you get plenty of it back into your system before hitting the sack. If you can’t find coconut water you can also drink a non-caffeinated sport drink like Gatorade, but these beverages tend to be high in sugar, something to be avoided after all the alcohol sugar consumed throughout the evening. We keep cases of coconut water on hand and find that drinking a cold glass of it before bed significantly reduces the aftereffects of too many glasses of whatever libation fueled the party. At the end of the night, drink herbal or green tea instead of coffee. While many believe a good jolt of caffeine is just what they need to sober up, coffee isn’t going to shortcut the metabolic elimination of alcohol in the bloodstream. That late night caffeine makes it harder to sleep, robbing us of the one sure remedy to over consumption. Using our own bodies as human guinea pigs we can tell you that after a hard night of drinking, adding coffee to an already acidic stomach is just asking for trouble. Instead, we like to finish with a nice cup of chamomile tea – it soothes and re-hydrates making a restful night of sound sleep more likely. Walk it off. Slow moderate exercise will help your body burn the alcohol a little more quickly. If you can take a walk before returning home great, if not, take a walk the next day. Don’t over do it by running or jogging though, or you may be puking in your neighbor’s bushes. Sleep in a cool place. We’re not talking about the cool tiles of the bathroom floor, either. If you live in a climate that’s not too cold, keep a window open while you sleep. If you live in a cold climate that requires the furnace be on through the night, turn down the thermostat to around 60 degrees. Your body is going to be burning a lot of alcohol and that process will keep you warm throughout the night. Whatever you do, don’t sleep with your heater on while bundled up in a warm duvet. You could end up with the worst headache of your life and a belly that takes all day to settle. Don’t drink and drive. While obvious, it warrants repeating early and often. If you aren’t going to be out with a designated driver you know to be trustworthy, take cabs or public transport. You’ll be going crazy on the cocktails, why skimp on transportation on one of the year’s most dangerous nights on the roads? Check your local listings for free or reduced rate cab service on New Years Eve. Many larger cities offer free public transportation to late night revelers. No excuses! Don’t take ibuprofen, acetaminophen, aspirin, or any other pain medication. After a night of drinking these could cause serious damage to your liver and stomach. They may help in the short term but in the long term they could be fatal. Don’t text, call, or facebook any current or former love interests! You may not remember the conversation/exchange, but there will be plenty of people to remind you later. And while it may be harder to remember this little tip after downing a few too many, keep this rule in mind as you head out the door: don’t be a jackass! Say it out loud, repeat, now get out there are have a Happy New Year! Happy New Year’s Gentlemen! What a treat to get your road tested hang-over methods.